The Maynard Community Fest is an annual event sponsored by the Assabet Valley Chamber of Commerce which celebrates community, culture and commerce. Main Street and Nason Street are both closed down and are lined with tents, booths and food carts, Memorial Park becomes a concert venue and a parking lot holds bouncy castles and thousands of people stroll through town. I’ve been happy to be the photographer for this great event for many years now. Usage: High-resolution digital copies of these photographs can be requested by sending the photo id’s (lower left corner) to dave@confluencevisuals.com. I’ll try to get them to you in a reasonable timeframe. No charge for participating businesses/organizations. Technical Information: I continue to eschew my DSLRs for events (and continue to not miss them at all as I’m on my feet for 6 hours and probably walk 4-5 miles during the day with my gear). The setup for the day was a Fuji X100S for the wide shots and the Fuji X-T1 with the 55-200mm f/4.5 was used for the closeups. I did a set of “high angle” shots and a quick pass through the fest with the X-T1 and the 10-24mm wide-angle lens. Processed with Lightroom 5 with custom presets for sunny and shade scenes. This is my 13th year photographing the OARS annual river cleanup of the Assabet (and now Sudbury and Concord) River(s), that event in its 28th year. It’s logistically impossible for me to visit all of the cleanup teams that span from Westborough to Concord, but I try to capture a number of them. The ever-changing nature of the cleanup and annual changes in river flow make some years less “photogenic” than others. I found some small groups in Concord (near Nashoba Brook), Acton, Maynard, and Hudson. To learn more about OARS and how it protects our local rivers, please visit: oars3rivers.org. Photographs from the Acme Theater production of “God of Carnage” (by Yasmina Reza). Directed by Michele Aguilon playing September 12-October 4. Actors: Bill Stambaugh, Rebecca Shor, Gordon Ellis, Sara Jones. Camera kit doing its job during a downpour. I mentioned in an earlier post that my main reason for investing in the Fuji X-T1 was related to an upcoming trip I was taking. Well, I’m back from that trip and thought it might be interesting to review what went right and wrong, along with thoughts for better planning for the next trip. 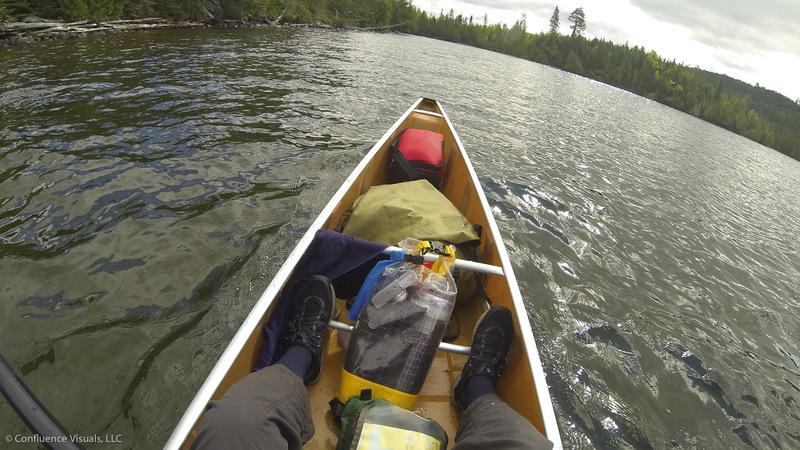 The task was to allow me to do some photography during a 5-day canoe/camping trip to the Boundary Waters Canoe Area Wilderness (located on the border between Minnesota and Canada). 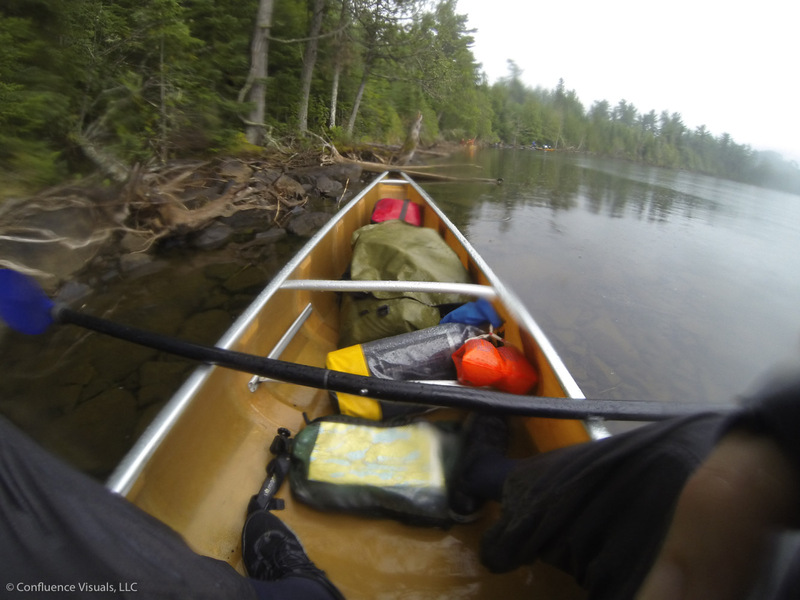 We were to be paddling on several lakes and portaging between them. A rough total of 30 miles. When you have to haul your gear / food / boats up a 1/4 mile long, 600 foot rise (one of the portages) you look for conservation of weight and space. 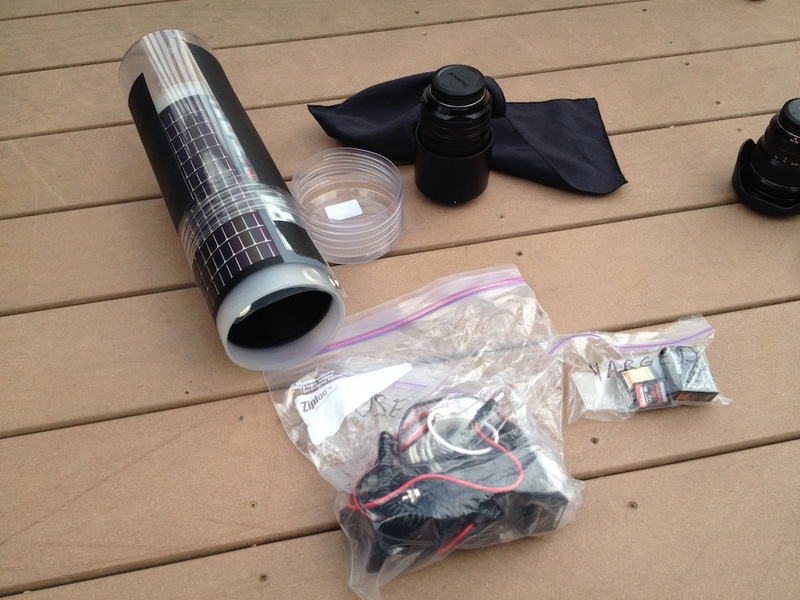 The kit also has to handle getting getting wet (up to and including immersion). 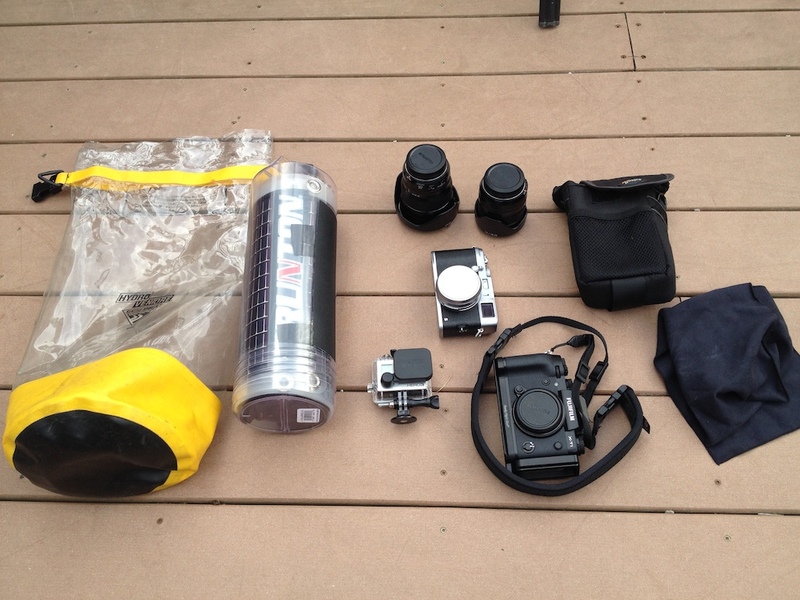 Two items: the MeFOTO tripod (and other support items) and a dry bag with the cameras, etc. (the boards are 5.5 inches apart if you want a size reference). The tripod and whatnot weighed in at 4.6 lbs, and the camera gear topped the scales at 9 lbs. even, a total of 13.6 lbs. 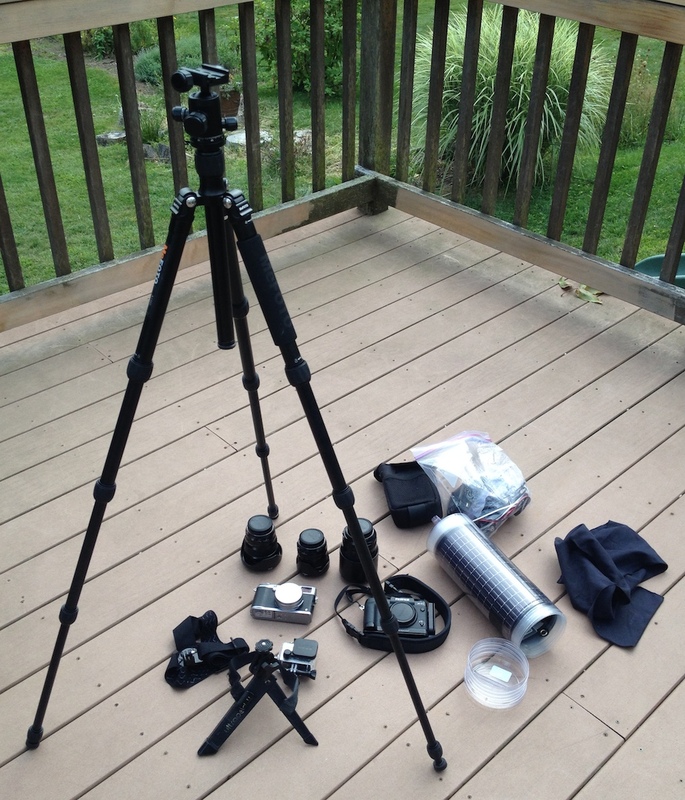 l-r: dry bag, 14 watt solar power and storage, GoPro Hero 3, X100S, 10-24mm lens, 18-55mm lens, X-T1, LowePro utility bag, lens bag, iPhone (not shown). The Watson charger can charge the X-T1’s W126 batteries and has a USB port so it can be used to charge the GoPro and iPhone. I opted to carry a spare battery for the X100S instead of trying to find/bring a separate charger. This turned out well as the X100S sips power compared to the X-T1 (especially if you keep EVF use to a minimum) and after a week of use I barely touched the first battery’s capacity. 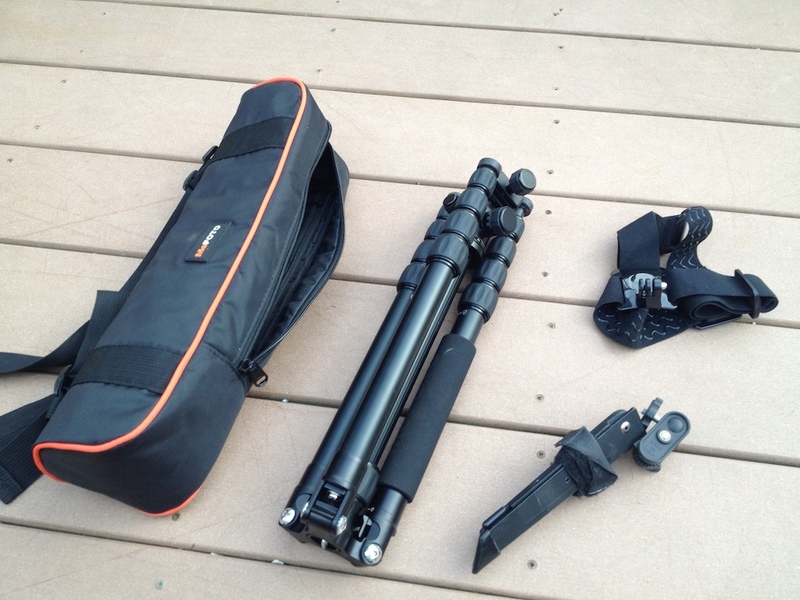 MeFOTO tripod, Ultrapod 2 tripod, GoPro head mount. So, how did it all perform. Generally speaking, very well. Everything that needed to stay dry, stayed dry – despite some rather hazardous conditions. No malfunctions. Given my relative inexperience working completely cut off from the world, I felt that the kit could have worked for a month or more before I would have exhausted the cards (I had 4x32GB SD cards for the Fuji cameras, plus 32GB in the GoPro.) Adding additional cards really doesn’t cost much in terms of space or weight, so it’s a budget and planning issue only to stay “off the grid”. Everything sealed up, but readily accessible. Charging the batteries (hiding from the sun under the PFD) Note the gaffing tape holding solar array to the boat. I have a lot of experience shooting from my kayak, but for this trip I was sentenced to paddle a canoe. 🙂 My lack of confidence with that boat made me much more conservative about when gear would come out of the dry bag. All of the gear just fit into the dry bag. Critically it was not possible to have a lens on the X-T1 and have the bag close. This was an error. I could have used a larger dry bag (although that has other issues), but I think the better answer was a separate, small lightweight “dry sack” that I could pop the two cameras into when underway. 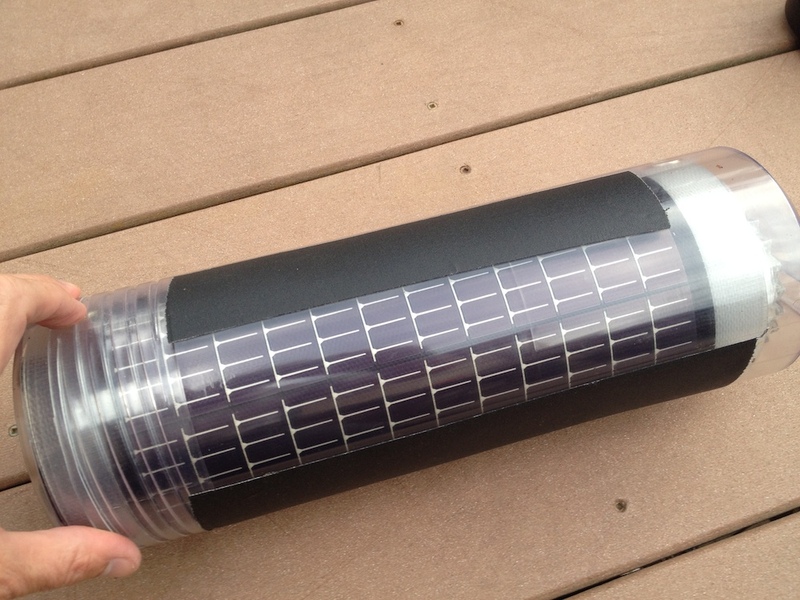 It can be cloudy for a number of days and it takes hours to recharge the batteries. All this means is that just because you have a solar power charging ability conditions and trip timing doesn’t mean that you can burn through your batteries. I was extremely conservative with my battery use on the X-T1. I would plan out my images, turn the camera on, take my shots, and turn the camera off. I had envisioned being able to charge while paddling, and this may be possible in the right conditions and with a confident paddler. I’d have no problems figuring this out in my kayak, but it never came to be on this trip. 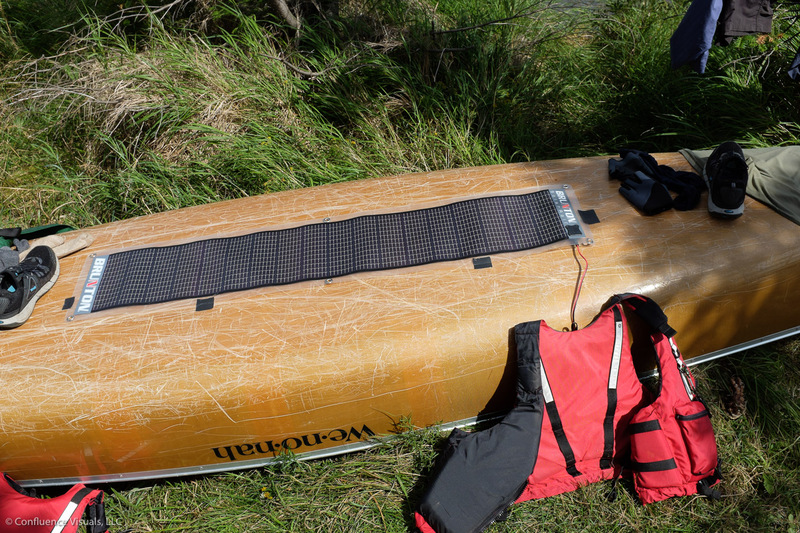 This meant that charging was limited to sunny, non-paddling time in a spot with no trees overhead — a rare confluence. The X100S is an awesome travel camera. I really should get a strap for it. 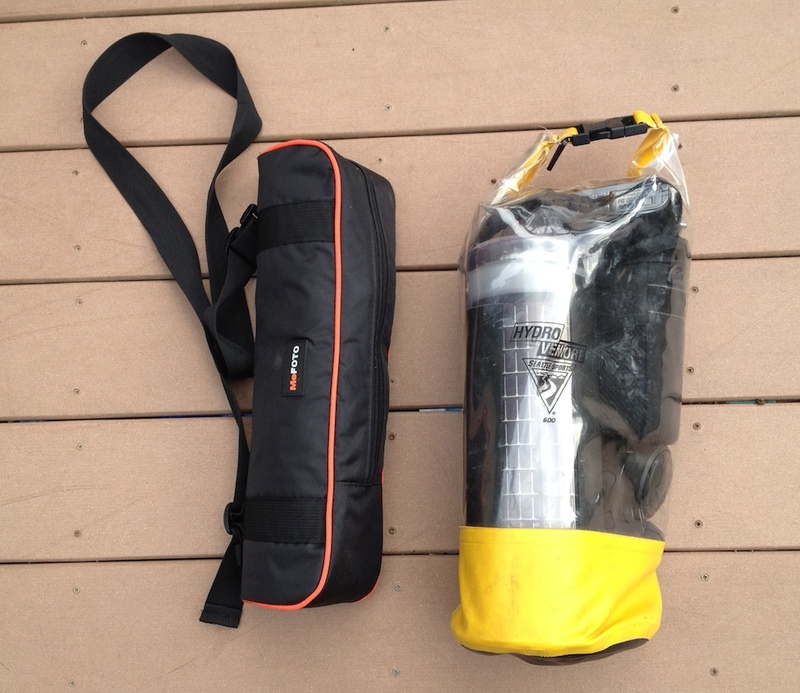 Don’t be lazy sealing up the dry bag – you never know when things are going to turn ugly. When conditions go to hell, the GoPro is a pretty handy camera. I should get a strap for it as well. My long experience shooting from the kayak made me over-confident. I should have done some more extensive tests with the full kit while still at home. This would have highlighted a few of the issues when I had time/resources to fix them. The bulb mode on the X-T1 is pretty cool. The iPhone is still pretty darn useful even when it’s not a phone. 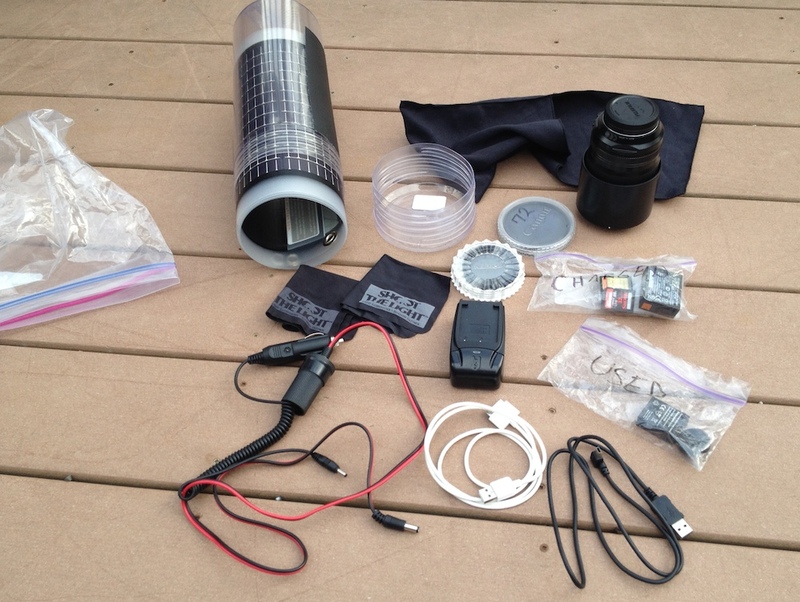 I occasionally used it for GPS, clock, timer, compass, sun path planner, constellation viewer, etc. Kept it off the rest of the time. Still had 90% of the battery available after 4 days and topped it off via the solar panel in short order. Well, that about sums it up. If you have any questions or comments, please let me know and I’ll do my best to reply to them.